Get together with friends and make some art! 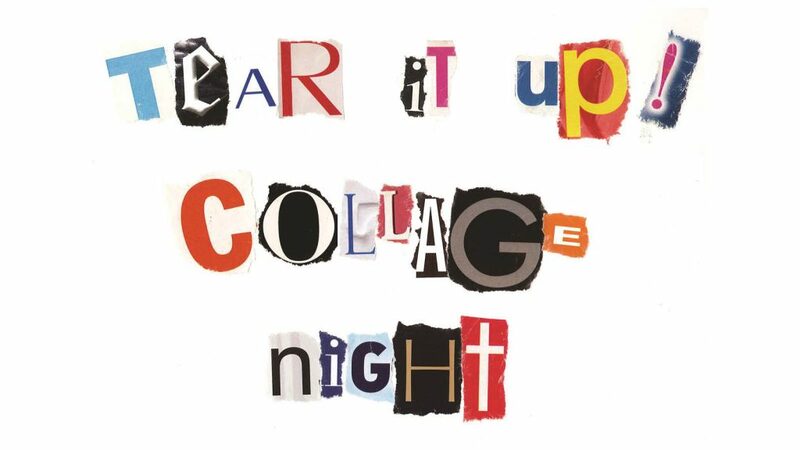 Inspired by the Karen Tam exhibition, participants are invited to cut and paste while you chat, listen to music, and sip some tea at our next Collage Night social. This free event is for artists and art lovers to gather in the Art Gallery spaces for a fun art night. RAG programs staff will open their vast collection of cool collage materials to lead a hands-on collage-making night for adults. Inspired by the Karen Tam exhibition With wings like clouds hung from the sky, the focus will be on black and white imagery and combinations of mark-making to make unique mixed-media collage works. See samples and demonstrations by gallery staff on how to use cut and ripped posters, photographs, decorative papers and magazines along with various mark-making tools to develop new artworks. Work on solo or collaborative collage pieces, take a break to try out brush painting techniques in the exhibition space, or participate in a quick casual tour of With wings like clouds hung from the sky. Free admission for ages 16+. NOTE: Due to the large number of "no-shows" by those who reserve free tickets, we have oversold seats to this workshop. While we will try to accommodate everyone, priority will be given to the first 30 people who have registered - latecomers may not be seated.